Earning the RAMP designation is an involved, all-encompassing process for any school counseling department. 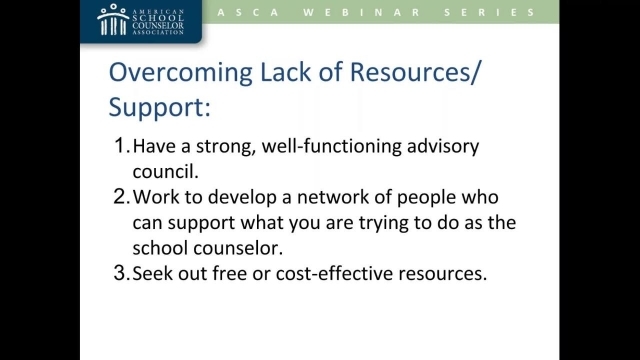 However, there are some unique challenges and opportunities to consider if you are the only school counselor in your school. Understand potential challenges for solo school counselors to earning the RAMP designation as well as strategies to help overcome some of these roadblocks. Discuss the key components to success – planning, organization and advocacy. Download accompanying handouts. Identify potential barriers to earning the RAMP designation as a solo school counselor. Identify strategies to help overcome roadblocks to earning the RAMP designation as a solo school counselor. Explain the importance of advocacy and its effect on delivering a comprehensive, RAMP-worthy school counseling program.